Understanding lens fungus:Lens fungus is a microbial growth on glass surfaces of camera lenses and other optical devices. It is literally an infectious disease of lenses which is very common. If you own lenses but haven't seen it, that is because you haven't looked. It takes a number of forms but the typical destructive growth pattern results from microscopic spores growing in webbed, branching mycelium structures across an optical surface. In some cases this can be cleaned off and the lens restored, but often the process is pernicious: metabolic products of the fungus etch the glass lens surface or coatings, or the growth may be on internal glass surfaces that cannot be reached for cleaning. Like dust or fingerprints on a lens, obstruction and obscuration of the lens progress in degrees, from a slight loss of image contrast and resolution to complete ruin. Using a flashlight and magnification to identify lens fungus: Effective diagnosis of the presence of lens fungus requires proper lighting and magnification, like any task in microscopy. A casual look through a lens towards a diffuse light source with the naked eye will not reveal any but the most severe cases. The most convenient critical method is to shine a bright flashlight through the lens while looking off-axis at the surfaces under the magnification of a 10X eye loupe. This is a low-power version of what a microscopist would call darkfield illumination. My best tools for this purpose have been simply a handheld LED tactical flashlight and a viewfinder eyepiece taken from an old discarded camera. I shine the light through one end of the lens, and hold the loupe to my eye and bring the lens up to a focused magnification. 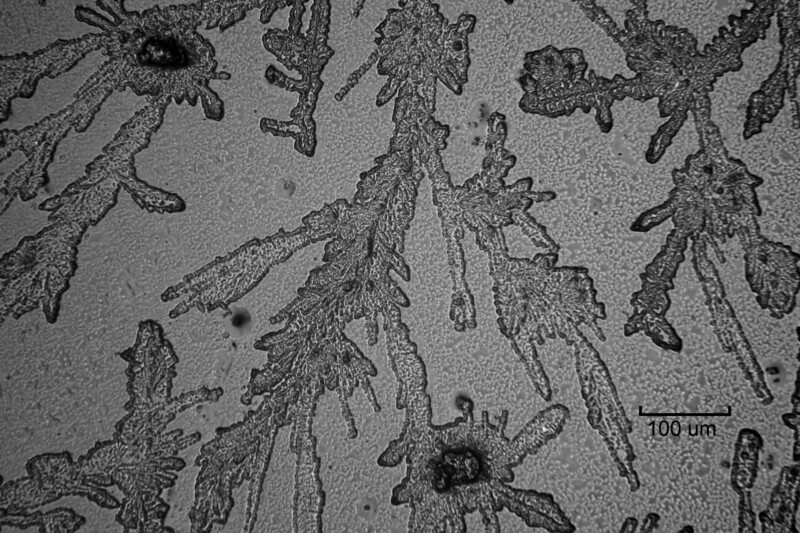 Every lens always has some dust contamination (short of clean-room conditions) that this examination will reveal, but the presence of the spreading fibrils of mycelium look quite distinct from ordinary dust. Fogging and other diffuse imperfections and degradations in the lenses and coating will also be revealed. Not to be pessismistic, but looking at the true conditions of one's expensive lenses can be frightening. They're never as clean as we might wish, and you might find damage. This is one of the worst specimens of fungus damage I have encountered in my optical engineering work. The item is a 32mm diameter heat-absorbing glass filter from an HBO 100 watt mercury lamp, which was part of a Leitz Dialux microscope. I thoroughly cleaned this filter, so what you are seeing in the photograph is not the fungus itself, but the irreparable etching of the glass caused by the fungus. No amount of cleaning will remove this damage, which shows why the common advice about cleaning lens fungus is typically futile. Sometimes fungal growth is superficial, has not damaged the glass, and can be cleaned, but typically the glass is permanently ruined as seen here. To the naked eye, this piece appears to have deposits, not etching, making it cloudy. Note the fine dendritic growth pattern of the fungal hyphae, which are narrow lines of etching surrounded by intact surface. Cloudier areas are entirely etched. The overall effect is to destroy the polished optical surfaces and ruin the function of the element. Consider several remarkable aspects of this specimen: (1) It was next to a glass condenser lens which was entirely free of fungal damage and debris. This strongly suggests that the composition of the glass is critical to both the growth of the fungus and the damage. (2) Being in the path of the mercury arc light would have exposed this glass to intense UV rays which would sterilize any microbes. Photographed with handheld Canon 5D Mark II, Canon 24-105mm L lens, Canon extension tube EF25 II, Mini-Maglite 3W LED. See in full resolution. This photomicrograph shows the fine structure of dendritic etching of the glass filter shown above. Most of the area is apparently undamaged, with the etched areas forming branching canyons several microns deep into the glass. Dark spots at upper-left and bottom-center are relatively deep pits many tens of microns deep; perhaps these were the rooted location of germinated spores? Photographed with Canon 5D Mark II in direct projection on the trinocular port of a Leitz Orthoplan microscope with epi-illumination and Leitz NPL 20x objective. 100 micron scale indicated. See in full resolution. 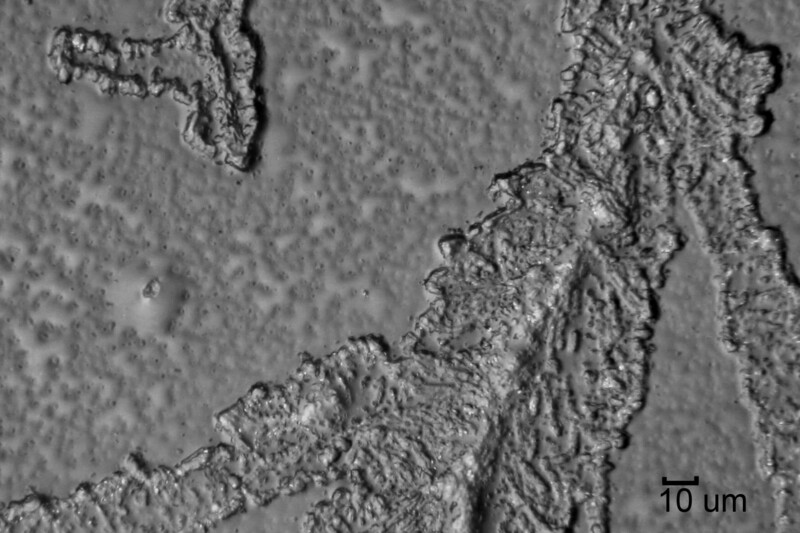 Larger magnification of an upper-left area of the previous photomicrograph. Apparently undamaged surface shows polishing characteristic of rippled surface with leveled peaks. Or it may be that the whole surface is damaged into distinctly different forms. Photographed with Canon 5D Mark II in direct projection on the trinocular port of a Leitz Orthoplan microscope with epi-illumination and Leitz NPL Fluotar 50x objective. 10 micron scale indicated. See in full resolution. Why does lens fungus grow? Fungal spores are everywhere and will grow whenever temperature, humidity, and nutrients exist. Ordinary house dust consists of carbohydrate (cellulose lint from fabrics) or protein (bits of you) that is fine food for fungus. Liquid water and light are not necessary. This dust typically gets pushed into the corners of a lens (ironically) from cleaning, where it collects, and these marginal heaps also tend to retain humidity. Humidity above 60 percent is reputed to be the threshold where fungal growth starts. All it takes is one spore to germinate on a single tiny lint fiber, and out go the fibrils across the glass, looking for more food. A fungal spore can feast on a tiny speck of dust for many days, covering many square millimeters of area with fibrils that will find other food present. Live fungus is basically a molecular machine that is powered by the minute chemical energy available in the dust, which dust is also digested into the substance of the fungal structure. This growth mechanism converts bits of energy-rich food into less energetic but more connected and purposed structures. The structures send forth runners (mycelium fibrils) to locate and tap more energy sources, in hopes of finding a food bonanza that will supply enough energy and material to launch baby funguses (spores) into the air, where they can travel to new, distant food sources. While the lens growth is typically not rich enough to fruit and launch spores, the resulting mycelium will degrade the lens. Besides the mechanical obstruction of the light rays the lens is designed to refract and transmit, the mycelium growth produces chemical byproducts which deter overdense growth, digest its food, and also happen to etch glass. Glass is inert and used to store strongly corrosive acids; how can fungus etch it? Glass can have a widely varied composition. The ordinary type of glass used for bottles to store acids and other corrosive chemicals is not at all the type of glass that optical lenses are made from. 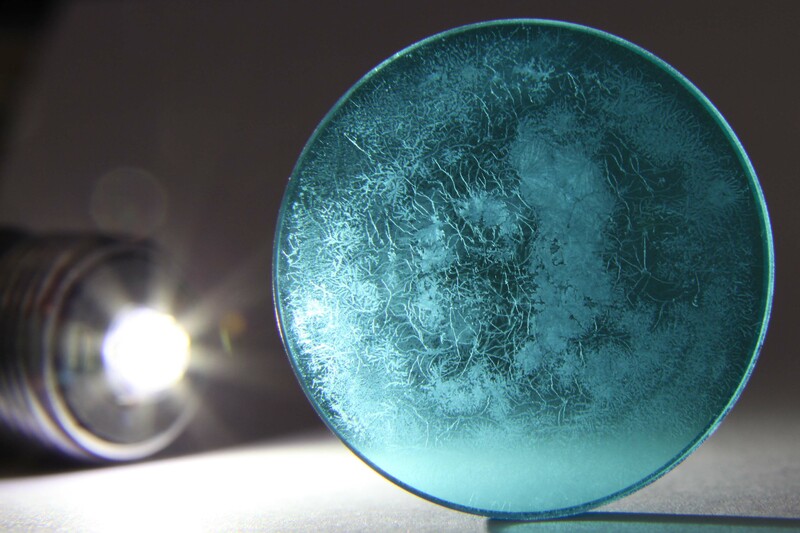 Microbiologists have been assuming that fungus cannot feed on glass itself, but given the variety of exotic glass recipes used in optical engineering, it may be that some types of glass provide some elements of fungal nutrition. Perhaps the etched surface is a better physical substrate which anchors or promotes growth. The highly detailed structure of the etching (as seen in the photomicrographs above) suggests that whatever metabolic product is disintegrating glass is concentrated and bound to the organism, and not some liquid that spreads indiscriminately. What can I do to avoid or stop lens fungus? Take away warmth, humidity, or the food source. Since this is not typically possible with perfect continuity, so lens fungus is simply a constant, progressive, accumulating threat. Sterilization is not typically practical and doesn't remove existing growth or prevent new growth on re-exposure.